In 2010, the BBC conducted a poll based on listeners & viewers votes to find the greatest guitarist of the last 30 years. The first thing I asked myself, is why only 30 years? Is that when the guitar was invented or are the BBC generally trying to dismiss anything older than that? This would mean no Jimi Hendrix, No Eric Clapton, No Brian May, No Jimmy Page etc. etc. So who would be featured? Well, let me throw some names at you, Nick Zinner was at number 39, Jamie Cook at number 34 and Thurston Moore at number 12. How many of them do you know? Well this week’s single is by a man who features at number 24, Bernard Butler. Bernard was born in Stamford Hill, north London in May 1970. He found fame in early 1992 when he teamed up with Brett Anderson to form Suede. Bernard co-wrote and played on their first eight hit singles until he decided to quit in 1994 after mounting tensions between him and Brett. Around the same time David McAlmont, who had been a member of Thieves, quit that band following even greater tensions and legal wranglings, so the pair, both on the rebound, forged a musical partnership. Yes reached number eight in the early summer of 1995 and spent eight weeks on the chart. 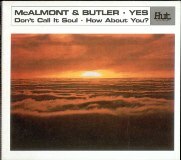 It was the opening track on the parent album The Sound of McAlmont & Butler which only reached number 33. The follow-up single, You Do petered out at number 17. The reason for this was that neither wanted to tour despite being badgered by the record company. However, they did make a few television appearance but it was not enough. David went on to collaborate with Ultramarine and then with David Arnold on a cover of Diamonds Are Forever which stalled at number 39. Bernard charted four solo singles with the highest, Stay, reaching number 12 in 1998. Three years later Yes was featured in the film Bridget Jones’s Dairy 2. It was possibly on the back of this that made Butler and McAlmont resolve their differences and reunite which they did in 2002 for a couple of hit singles, the biggest being Falling which climbed to number 23. They did manage to record a second album called Bring It Back which spent just two weeks on the chart and peaked at number 18. Bernard recalled his proudest moment, “I remember going to Ally Pally on Bonfire Night and there would be fireworks each year and at the end there would be a finale and normally there would be a piece of classical music like Prokofiev or something. One year I was with my kids there and Yes was the song at the finale and for those three minutes that made people happy which made me very proud. Oh, in case you were wondering; Nick Zinner was with the Yeah Yeah Yeahs, Jamie Cook was a member of the Arctic Monkeys and Thurston Moore with Sonic Youth. As for the top three in that poll, well Matt Bellamy from Muse was third, Slash came in second and topping the list was the Red Hot Chili Peppers’ own John Frusciante. David McAlmont sings a bit like Cilla Black on this …worrying!